We drive a lot of fast cars and bikes here at Skyward (while wearing the appropriate safety gear of course) and when we got the chance to help speedTV go just a little bit faster, we had to take it. 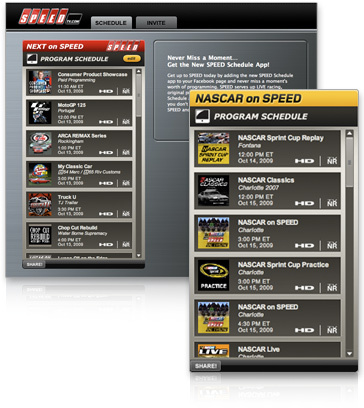 Speedtv.com knows about the experience the crew at Skyward has with widgets and apps and asked us to create the Speed TV Speedwire Widget so they could share the Speed schedule everywhere. Speed understands the importance of social media integration into their site, so users of Facebook, MySpace Bloggers and people who have Konfabulator installed can grab the schedule and take it with them and never miss an episode. Now if we can just talk the nice people at Speedtv.com into letting us find a way to take a race car out for a spin. Remember to tell them Skyward sent you! This entry was posted on Tuesday, September 15th, 2009 at 10:06 am Responses are currently closed, but you can trackback from your own site.